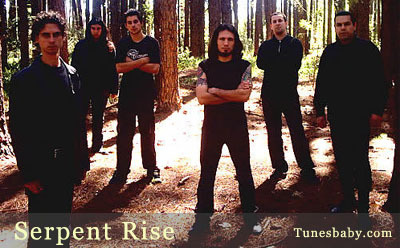 'The brazilian band, Serpent Rise, started activities in the first months of 1993. Formed by Agnaldo (vocals) and Júlio (guitars), they had a slow and heavy sound. The band recorded the first demo-tape, Anastenárides, in March of 1994. Because of this recording, Serpent Rise was choosed to play in B.H.R.I.F. (Belo Horizonte Rock Independente Festival), with Dorsal Atlântica (BR) and Anathema (UK). Still in the same year they had a song included in the cd compilation The Winds of a New Millenium I, released by Demise Records. In 1995 the band recorded a promo-tape: Travellin' Free..., to show the musical evolution and increase the promotion on other countries. This recording received good reviews from european and japanese magazines/zines. In the first trimester of 1996, Serpent Rise entered in studio and recorded the seven songs which are part of the debut: Gathered By... . This album can be defined as a mix of traditional doom metal, gothic rock and progressive. When the band was negotiating with some labels the release/distribution of the album, the band kept making concerts and then made the first appearence in São Paulo, playing with Sextrash (MG), Guehenom e Desmondus Rothundus (SP). In 1998, two years later, the band signed with Megahard Records and finally saw their first full length released. Many concerts were made in the south of Brazil, to promote the album and this includes an unforgettable concert with Amen Corner, in the state of Santa Catarina. 1999 and 2000 were two difficult years for the band, once the problems with line-up and internal ones made impossible for the band to continue and with this the band was put on hold.